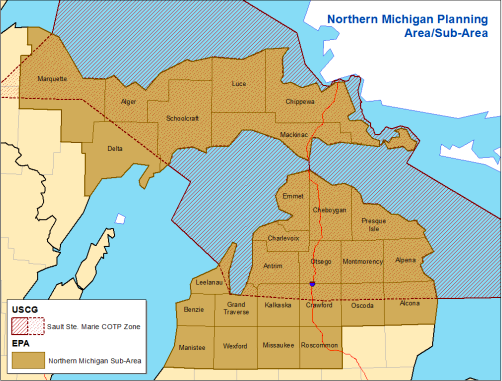 The Coast Guard's northern Michigan oil spill response area. The U.S. Coast Guard will open a new facility to prepare for a potential oil spill in the Great Lakes. As part of the Coast Guard reauthorization bill signed into law by President Trump Tuesday, they will open a National Center of Expertise in the Great Lakes. U.S. Senator Gary Peters (D), who sponsored the provision, says the facility will research clean up and response methods to an oil spill in freshwater. At a Senate hearing last year, former Coast Guard head Paul Zukunft said they weren’t prepared for an oil spill in the Great Lakes. "I would go on the record to say that the Coast Guard is not semper paratus for a major pipeline oil spill in the Great Lakes," Zukunft said. A final location for the facility hasn’t been determined. It will open within the next year. Environmental groups say the U.S. Coast Guard is not ready for an oil spill in the Great Lakes. The Coast Guard is required by law to have a plan for a spill. However, Margareta Kearney, an attorney at the Environmental Law and Policy Center, says they don’t. “There was testimony that clearly stated the Coast Guard is not at the ready to respond to an oil spill in the Great Lakes,” Kearney said.